SNOWBALL FIGHT! Crowds converged Tuesday for a massive snowball fight at Meridian Hill Park in D.C.
Much of the District was shut down after a storm dumped several inches of snow on the region -- all the more reason for the D.C. Snowball Fight Association to step into action. SNOWBALL FIGHT! 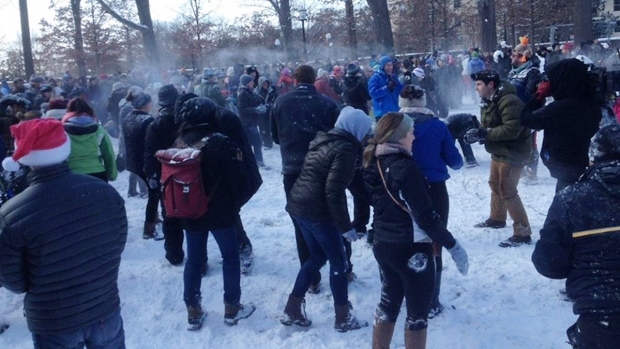 Crowds are converging for a massive snowball fight at Meridian Hill Park in D.C. The group, which has been organizing chilly battles for about five years, originally planned Tuesday's snowball fight to take place at Dupont Circle. The battle was moved at the last minute because the National Park Service plowed Dupont Circle Park a little too soon, but the switch didn't keep the cold-impervious crowds away. About 150 people showed up, as well as about five dogs -- and 20 or so news crews. The fight began around 11 a.m. Tuesday, and and afterward, the nearby James Hoban's Irish Restaurant & Bar (1 Dupont Circle NW) had a room reserved for snowballers. The pub was also offering a prize for the "best"-dressed (whatever that might mean) player. And we also want to state the obvious: anyone who behaves recklessly is responsible for the consequences." Tuesday's battle was the group's first organized snowball fight of the year. It hosted four last year. Past battles have drawn hundreds of revelers.